In addition to the fig, pecan, and flax crackers I made for my Mother's Day care package, I also sent two kinds of granola bars. I found two recipes that sounded fantastic and couldn't decide between them, so I went overboard as usual. 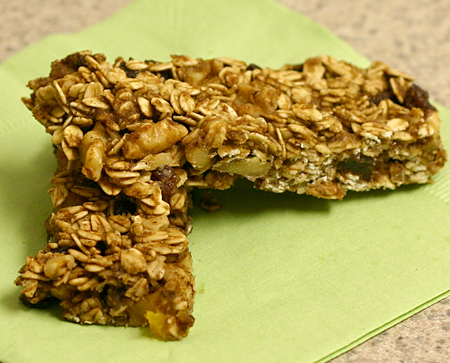 Luckily granola bars fare well in the freezer, so none of them went to waste. Both have relatively little refined sugar and are gluten-free, and I thought both were delicious. Unfortunately the cocoa and orange variety (on the bottom in the picture, if you can actually tell them apart) had too much liquid and didn't stay together very well at all (I pieced one together for the picture). I loved the combination of chocolate and orange, though, and I think the problem could be remedied simply by reducing the amount of orange juice. The fig, raisin, and walnut ones were fabulous, too, and these held together well. So, here are both recipes. I recommend going overboard and trying both. What do you have to lose? Combine oats, walnuts, salt, cinnamon, cocoa powder, zest, and dried fruit in a large bowl. In a separate bowl, stir together orange juice and honey. Pour the orange juice mixture into the dry ingredients and stir well. Let this sit for 15 min, and then add more orange juice if the mixture isn't sticking together. Spread this out on a parchment-lined baking sheet so that it's about 1/2" thick, and bake at 350 for 25 min. Then let cool and cut into bars. Wrap individually and freeze for long-term storage. Makes 20 bars. Combine oats, flax meal, teff flour, walnuts, figs, raisins, cinnamon, and ginger in a large bowl. In a separate bowl, stir together agave nectar and eggs. Pour the agave mixture into the dry ingredients and stir well. If you need to moisten the mixture so that everything sticks together, add water a tablespoon at a time. Spread the mixture out on a parchment-lined baking sheet so that it's about 1/2" thick, and bake at 350 for about 20 min. Then let cool and cut into bars. Wrap individually and freeze for long-term storage. Makes 20 bars. 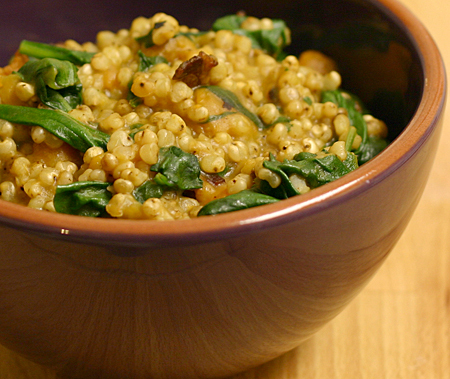 I loved this simple quinoa pilaf, especially because my last pilaf was virtually inedible. The flavors were very simple, but the combination of quinoa, tomatoes, raisins, and pine nuts was perfect. I got the pilaf recipe from Gluten-Free Goddess, but decided to stuff cabbage instead of mushrooms. The pilaf would be great alone, as well (I had some left after stuffing the cabbage, and enthusiastically gobbled it up while the cabbage rolls were baking). I'm submitting this dish to Weekend Herb Blogging, which is organized by Haalo from Cook (almost) Anything At Least Once, and hosted by Astrid from Paulchen's Foodblog. Bring a large pot of water to a boil, and then add cabbage leaves and boil until they're tender (about 5 min). Remove the leaves from the water and set aside to cool. While the cabbage cools, heat the oil in a large skillet over medium heat. Then add the garlic and saute for a minute. Stir in the remaining ingredients, season with salt and pepper, and let heat through for a few minutes before removing it from the burner. 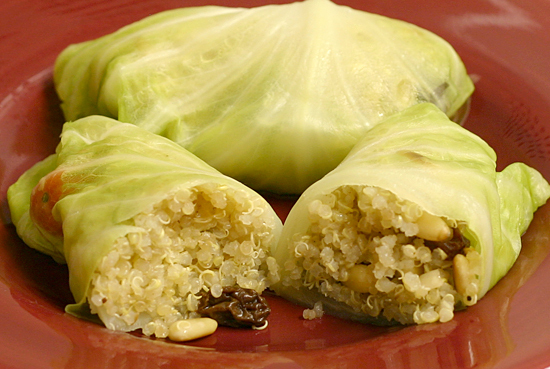 Then stuff each cabbage leaf with about 1/3 cup quinoa pilaf, roll the cabbage up tightly, and place it seam side down into a large baking dish. Bake at 350 for 20-30 min. Serves 4. Even after making Brunswick stew this week (which is getting better and better! ), I still have butter beans in my freezer (for some reason I thought it was a great idea to cook 3 pounds of them a few months ago). Before I made the stew, I was inspired by Gel's kitchen to make this salad. I made the recipe and it was pretty good, but then I got the idea to add whole grain mustard. 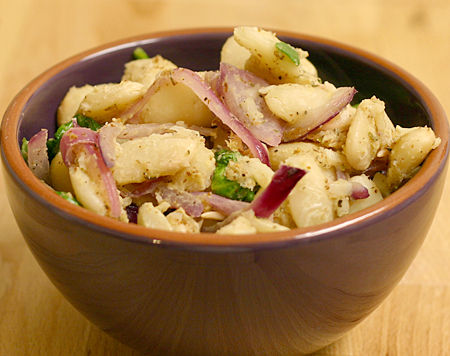 Sometimes I have random last-minute ideas that fail miserably, but this one took the salad from ok to wonderful. Next time I'll probably add more spinach, but it was great just as I made it. I tried the leftovers warm and cold and couldn't decide which way was better. Now the only problem is deciding how I want to use my last bag of butter beans. Do I make more of this salad? Do I try mashing them up like potatoes (an interesting idea I just read about)? Any favorite recipes out there? Heat oil in a large skillet over medium heat, and then saute the onion until it's very tender (about 10 min). Add butter beans to the skillet, season with salt and pepper, and stir everything around for a couple of minutes. Then add spinach, stir well, and cook until the spinach wilts. Stir in the mustard and serve. Serves 3-4. I'm ecstatic right now. I have a lot of recipes in the queue, but I have to tell you about this one immediately. One of my absolute favorite meals in the world (perhaps THE favorite) is my grandmother's vegetable soup with cornbread. The soup has a creamy tomato base with a bit of a kick (thanks to Tabasco), and is filled with butter beans, okra, corn, and potatoes. My cousins and I fight over the soup, and I'm really hoping that Grandmother remembers that I organized and catalogued her chest freezer last month and will give me at least one of the three containers of soup she has left. And very similar to her vegetable soup is her perlue stew (a few Google searches revealed that people spell it all kinds of ways: purlo, perlo, and purlew are just a few). Perlue stew has a very similar base, but typically contains chicken, rice, potatoes, and corn. It's heavenly as well, but for some reason Grandmother didn't make it nearly as often. Unfortunately I've been intimidated to make both. I'm afraid to even attempt her vegetable soup because, let's be real, it won't be the same. I've pleaded for a recipe, but it's one of those things where she throws things in the pot and "knows" when it's right. I do have her recipe for purlue stew, but nobody else in the family has succeeded at replicating it (and Mom found out the hard way that you must use a roaster chicken because of its higher fat content). 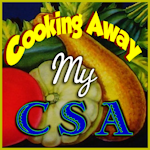 But then last month I was flooded by recipes for Brunswick stew from the Daring Cooks challenge. 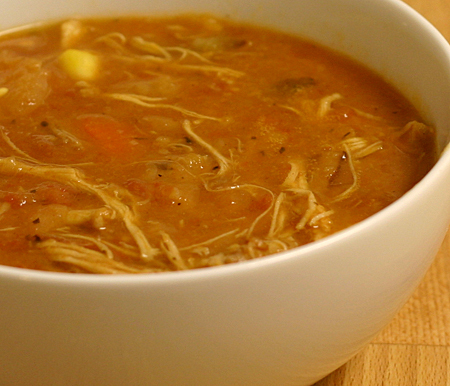 Brunswick stew is a combination of Grandmother's vegetable soup and purlue stew. It has some kind of meat (typically beef, pork, or chicken along with some random other ones - sometimes squirrel or rabbit), butter beans, corn, potatoes, tomatoes, and sometimes okra. But that creamy tomato base is common among all of three of them (apparently to Burgoo as well, which I've never tried, but is basically Kentucky's version of this stew). I associate Brunswick stew with barbecue restaurants. If a restaurant doesn't sell Brunswick stew, don't eat the barbecue there. Trust me. The influx of Brunswick stew recipes last month made me drool, and I'm trying to eat up the cooked butter beans I have in my freezer, so I had to make this, and boy am I glad I did. I don't know if this is the absolute best Brunswick stew I've ever had, but it's pretty close. I'm used to the Georgia-style stew with beef, so the chicken version (more typical of Virginia) was different but equally as enjoyable. If it follows the Rule of Soups and Stews (they get better and better as the days go by), I'll be in heaven all week. And even more exciting is that the base is the exact same creamy tomato base of Grandmother's vegetable soup. Forget the PhD, I'm far more proud that I've mastered the stew/soup base that I love so much! Cook bacon in a large soup pot over medium heat. When it's done, place it aside on paper towels and crumble it. Add the onions and peppers to the bacon grease and cook until the onion is tender. Then push the onions to the side of the pot, and add the chicken, making sure that it's touching the bottom of the pot as much as possible. Sear the chicken on both sides (a few minutes per side), and then add stock, bay leaves, Tabasco, and black pepper to the pot. If the chicken isn't covered by the stock, add more until it's almost completely submerged. Bring the stock to a boil, then reduce heat and simmer for 30 min. Remove the chicken from the pot and set it aside to cool. Then add carrots, potatoes, butter beans, corn, ketchup, tomatoes, and crumbled bacon to the pot. When the chicken is cool enough to handle, shred it and add the meat to the pot. Then bring the stew back to a boil, reduce heat to medium low, cover, and cook for 90 min, stirring occasionally. If the stew base is very watery, leave the cover off for a while so it can thicken, or add more stock or water if it's too thick. After the stew is done, mash the stew with a potato masher for a few minutes to create the creamy base. Taste and add more Tabasco if necessary, and remove the bay leaves. Serves 6-8. Since I've started packing up my apartment, I've become even more sensitive to the fact that nobody wants more junk to sit around. So for Mother's Day, I wanted to give Mom something useful. Between work and taking care of my grandmother, she has been excessively busy lately, so I decided to make her a care package of sorts, with healthy snacks that would keep her going at work and on her weekend trips. It was also a present for me because it gave me an excuse to try new recipes (thanks, Mom!). These crackers sounded perfect for Mom, so I gave 'em a shot. They recipe made more than I expected, though, and I ended up taking some to a cookout with friends. Between my friends and my parents, I've heard a lot of good things about these crackers. I loved them, too, and had to package them up before I scarfed them all down. And best of all, these crackers are the easiest ones I've ever made. They're thick, and don't require the use of a rolling pin (I'm still not very skilled with my rolling pin). In fact, their appearance is more similar to a cookie than a cracker, and they do have a hint of sweetness from the figs and brown sugar. Sweet cracker? Savory cookie? Call them whatever you want, but I highly suggest making them. Combine flax seeds, almond or flax meal, baking mix, baking powder, salt, and brown sugar in a large mixing bowl. Using a pastry cutter or two knives, cut the butter into the mixture until the butter is in tiny pieces and well distributed throughout the flour/flax/etc. Add the pecans, figs, and milk to the bowl, and stir until everything is mixed well. If you're having trouble incorporating all of the flour into the dough, add milk a tablespoon at a time (I added about 1/4 cup more). Cover the bowl with plastic wrap and refrigerate for 10 min. Then divide the dough into two pieces and roll each piece into a log with a 2" diameter. Using a sharp knife, slice the log into 1/4" slices and place them on baking sheets lined with parchment paper (some of my crackers fell apart as I was slicing the logs, but I pieced them back together and it worked fine). Then bake the crackers at 325 for 20-30 min, until they are golden brown. Let them cool before serving or storing. Makes about 30 crackers. I'm guessing that a lot of people have had sorghum syrup at some point in their lives. And those of us who have adopted a gluten-free diet have almost surely had sorghum flour and sorghum-based beer. In fact, I use sorghum flour more than any other type because it seems to work as a multi-purpose flour and has a mild taste that is great in all kinds of baked goods. However, I hadn't seen sorghum grains until I received a bag of sorghum from Shiloh Farms as part of the first place prize package in the Whole Grains Council's photo contest last fall. Sorghum grains are round, similar to millet or quinoa but much larger. The bag listed several cooking options, and suggested popping it. 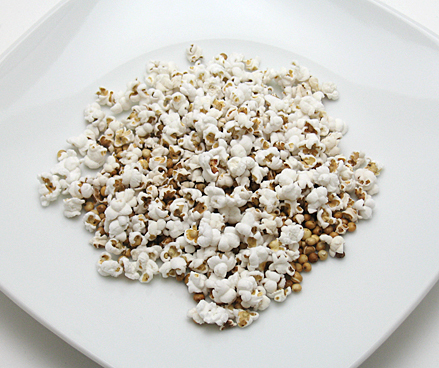 This intrigued me, so I immediately used my favorite method of making popcorn with the sorghum (put a handful in a paper lunch bag, roll the top over a few times, and cook in the microwave on the popcorn setting). It was good. Really good. It tasted similar to popcorn, with a slight millet-like quality. The only problem was that many of the kernels didn't pop, but I'm wondering if this could be remedied by cooking it on the stove. I only had one bag of it, though, so I decided that I should resist popping all of it and try another cooking method. And then I forgot about it for 5 months. I recently rediscovered my sorghum while taking an inventory of my pantry in preparation for my upcoming move, and finally got around to cooking more of it. There was a recipe for sorghum pilaf on the bag, so I decided that was the route to take. But instead of following that recipe, I substituted my sorghum for quinoa in a pilaf with sweet potato, spinach, and bacon that I found at Sounding My Barbaric Gulp!. First, I must tell you that sorghum takes forever to cook (about an hour and a half), so I was hoping that it would be tasty enough to compensate for the time. And I was also hoping to share an amazing recipe for sorghum because I had an extraordinarily tough time finding anything online. The first few bites were good, very different, but pretty good. It had a much stronger flavor than it did when popped, very earthy I would say. But by the fourth bite I had had enough. I've been able to eat a bite here and there because I hate to throw away leftovers, but I can't take anymore. So unfortunately I don't have a recipe to share, but do try popping it if you ever come across sorghum grains (that's what will happen with the remainder of my bag). And I bet this pilaf would be good with quinoa, as it was originally made. I'm disappointed that I didn't find my new favorite whole grain, and even more perplexed at how sorghum could be so great in other forms. It was a fun experiment, though! My favorite farmers' market opened last weekend, and I'm so happy to have plans every Saturday morning again. I'm trying to enjoy the spring offerings and not think about the fact that I'll move before the market really gets going. Last week I picked up rhubarb on a whim. The challenge with rhubarb is that most recipes call for tons of sugar to cancel out its sour nature. However, I really enjoy rhubarb's sourness, and I also try to avoid much added sugar. So, I decided to cook the rhubarb into a compote with strawberries (for some natural sweetness) and then added small amounts of honey until I was satisfied with the flavor. Luckily my strawberries were very sweet and in the end I didn't have to add much honey at all. 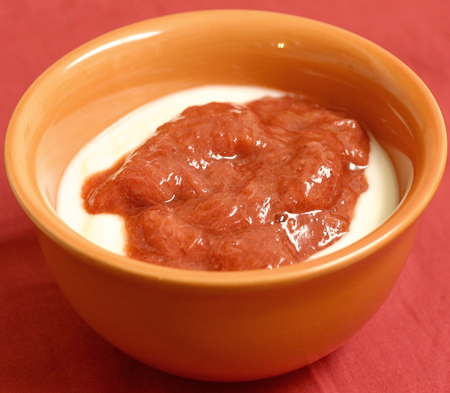 I've added this compote to yogurt and oatmeal for breakfast, and I've also eaten in by itself as a dessert because it's just that good. I just finished the last of it and I'm kicking myself for not getting more rhubarb at the market this morning. I'm submitting this dish to Weekend Herb Blogging, which is organized by Haalo from Cook (almost) Anything At Least Once, and hosted by Lynne from Cafe Lynnylu this week. Put the rhubarb and strawberries in a large saucepan and cook over medium-low heat, stirring occasionally. When the fruit has broken down significantly (after about 20 min), add honey or agave until it's sweet enough for you. Continue to cook for 10-20 more min. Makes about 2 cups. First off, I really appreciate all of the comments everyone left on my post about my grandpa. And while I was spending time with my family last weekend, I learned the secrets of my grandmother's fried chicken. She hasn't made it in years, but the whole family remembers how delicious it was. Apparently it requires cutting up your own chicken so that the pieces are the same size, removing the skin, seasoning the chicken (not the flour), soaking the chicken in buttermilk for 24 hours before dipping it in flour, and then cooking it low and slow. 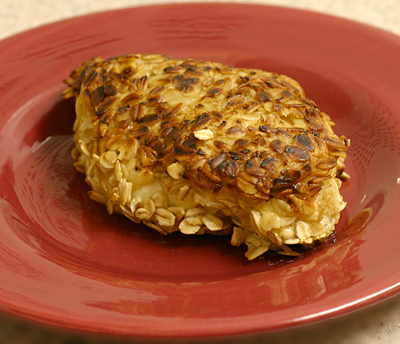 One day for a special occasional I'll get around to trying this method (I doubt that it will be as good as Grandmother's.... nothing ever is), but before I learned the secrets I made this incredibly easy oat-crusted chicken. This was incredibly delicious the night I made it, very crispy on the outside and tender and juicy on the inside, but it's not something you want to eat leftover. Just trust me on that one. Now that April is behind us, it's time to wrap up the cookbook of the month, Whole Grains for Busy People. Overall this is a fantastic cookbook if you're trying to ease whole grains into your meals or trying to cook whole grains with limited time. My favorite recipe was the turkey ragu I made last month. Even when I lost my appetite before my dissertation defense, I still wanted to eat it. I also really enjoyed the macaroni and cheese with chicken and spinach, thai fish curry, and this chicken (the night I made it). The hominy and bean chili wasn't my favorite recipe for chili, but it was pretty good too. None of these recipes are going to win awards, but they're tasty, healthy recipes, and will give you a satisfying meal at the end of a long day. If you have more time and only want to buy one book, I would recommend buying Lorna Sass's Whole Grains Every Day, Every Way, but this book is probably more suitable for most people who simply want a fast way to get healthy food on the table. Season both sides of the chicken with salt and pepper. Spread the flour out on one plate, and combine the oats and lemon zest and spread on a separate plate. Pour the beaten egg into a wide, shallow bowl. 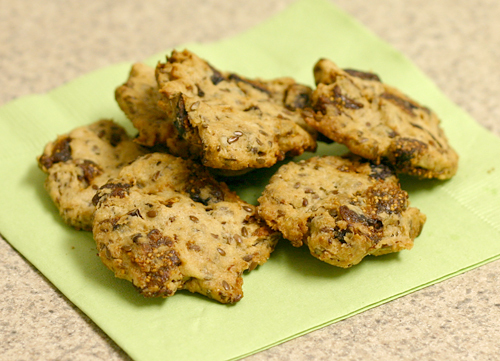 Dredge each chicken breast in flour, then dip it in the egg, then coat it in the oat mixture. Heat the oil in a large skillet over medium heat. Brown both sides of the chicken (about 2 min per side), then cover the skillet, reduce heat to low, and let cook until chicken is cooked through (about 10 min). Serves 2-4. I distinctly remember the first time I ate sweet potato cobbler. I was about 10 and had just enjoyed breakfast on my grandparents' porch. My grandpa Al always quizzed me about whether I had tried different foods (usually it was some uncommon fruit or vegetable, a classic southern food, or something weird he concocted). I was an adventurous eater compared to most kids, so I tried quince jelly (it was delicious), tomatoes with sugar (not my thing), and even cornbread doused in buttermilk (you should have seen the look on my face - I haven't had any buttermilk since). And all throughout breakfast that day he told us about sweet potato cobbler. I love sweet potatoes and it's hard to beat cobbler, so I was excited when he announced that he had some in the refrigerator and insisted that I try some (never mind that it was still early in the morning). As I expected, I loved it, which tickled Al to death (as my grandmother would say). (Un)fortunately, Al passed away last weekend. He found out about a week before that he had terminal cancer, and luckily didn't have to suffer very long. I made a last-minute trip down to Atlanta to see him (hence my lack of posting), but didn't make it in time. We were all as mentally prepared as possible, but that never seems to be enough. As we reflected on our memories of Al over the weekend, it always came back to food. Al loved to garden, he loved to cook, and he LOVED to eat. I remember spending summer mornings shelling peas and beans with Al and Grandmother in the basement. Al also taught me how to make pickles. Even when he no longer had energy to spend hours in the garden or kitchen, he would give me numerous tips on growing and preserving various fruits and vegetables (I now wish I had taken notes!). Al also won me over with food. He and my grandmother got married when I was 6, and I think we first bonded over our love of eating. Before they got married, I was out in the yard with them (likely picking up pine cones, as that's Grandmother's favorite activity), and Al said that he had something for me inside. We went in and he handed me a few Bugles (you know, those horn-shaped corn chip things). Grandmother wasn't excited about this because she thought it would spoil my dinner, but Al explained that it was just a "sample," and samples don't count. Almost every time that I saw Al, one of us would make a joke about having a sample of something and the calories not counting (sometimes the sample would be a large piece of cake, but as long as we called it a sample, it didn't exist). I was hoping to bring Al a box of Bugles last week, but oh well. Instead, I made a sweet potato cobbler today, because I know that's what he would want me to do. Instead of using his recipe, I made a gluten-free, low-sugar version. I made a small amount because I wasn't sure how it would taste, but I loved it. It was very different from Al's, but fantastic and still reminds me of him. Now I wish I had made a big pan of it! Cook sweet potato slices in boiling water until tender (about 7 min). Then drain the sweet potato and place it in a small baking dish (I used a 4 cup round Pyrex dish). 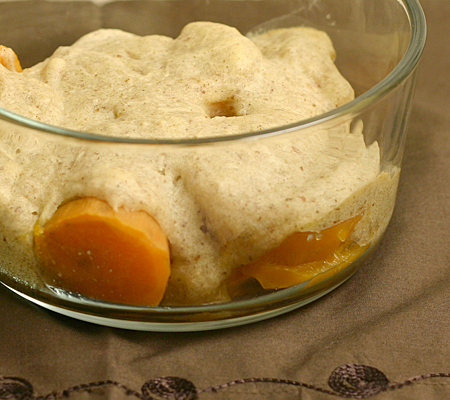 While the sweet potato is cooking, combine flours, starches, sugar, salt, xanthan gum, and spices in a small bowl. Combine the orange juice and butter, and stir this into the flour mixture. Then add enough milk so that it is the consistency of muffin batter. Sprinkle the lemon juice, agave nectar, and vanilla over the sweet potatoes, and then top with spoonfuls of the batter. Bake at 350 until the dough is set and beginning to brown (about 30 min). Serves 2.